Handmade wedding horseshoe personalised with the bride & grooms names. Finished with organza bows & roses. The perfect wedding day keepsake. 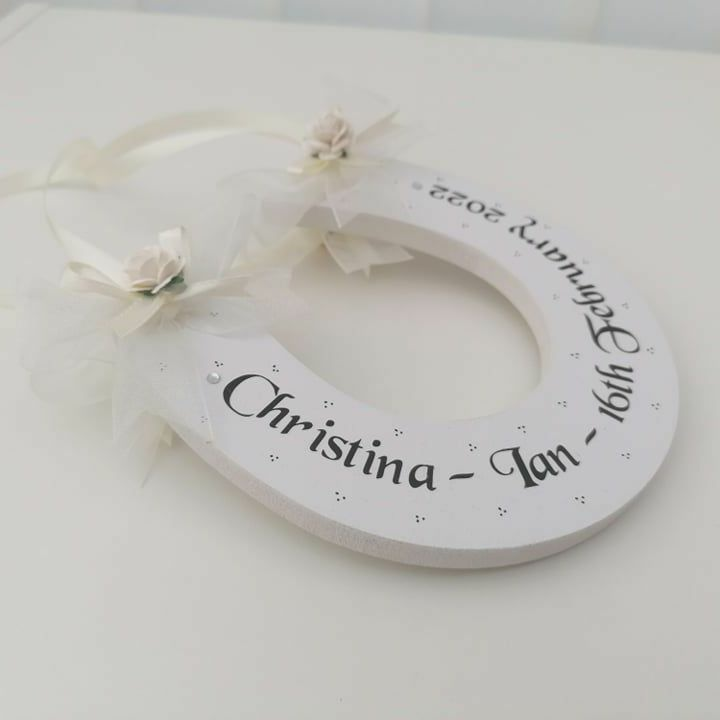 A personalised wedding horseshoe is a unique wedding keepsake gift. It is tradition to present this horseshoe to the Bride after the ceremony usually by one of the younger children, and is meant to bring luck and fertility! Equally fitting is to give as a gift as you can also personalise the back of the horseshoe. Dressed with ivory ribbon & mulberry roses & diamontes or pearls. This horseshoe is hand painted in Ivory and varnished. I just wanted to say a really big thank you for the effort you have put into finishing & getting the horseshoe sent to us when you were so poorly. It is very beautiful and we are very pleased with it. I am contacting you to say a big THANK YOU for the beautiful personalised horseshoe I ordered for my grandaughter's wedding. If I had to give you, as a company. a mark for the service you provide it would be no less than 100%! After placing my order, I had two emails not only confirming my order, but also one for receipt of payment. It was made clear on your website the length of time for this to be personalised, which I think is great information for anyone who may be looking to order an item urgently. I then had three further emails informing me of the progress, then another to say it was ready, and en route in the hands of Royal Mail. It arrived in a box, well packaged with tissue paper and tied with ribbon. When I opened it to take a look at the finished item, I was thrilled with the end result and once again can only say thanks for everything. I would have no hesitation in recommending your superb service to family & friends. I have today received my order. I am delighted with my daughter's wedding horseshoe, I cannot wait to give it to her on her wedding day 25 June. It really is beautiful. I ordered this horseshoe as a gift for my sister on her wedding day from my baby daughter. It arrived really quickly and is lovely. I'm sure my sister will be thrilled with her keepsake. Thank you. horseshoe after the event is rather unusual but I couldn't resist. It is so unique and a wonderful keepsake of their special day. I think I was as delighted handing it to her as she was to receive it. The quality of the horseshoe, design and craftsmanship is outstanding and I'll certainly be visiting your site again. Thank you very much and keep up the fantastic work. Thank you so much for your prompt service, I received the horseshoe today, it is absolutley beautiful and very well packed. I shall certainly order from you again. I ordered this for my sisters wedding as a keepsake for her. It arrived very quickly and you worked very hard to get my order to me on time as I was late ordering. When the horseshoe arrived I was very pleased, it is a lovely well made item and very pretty. Perfect gift fo a wedding. I will definately be ordering from here again.